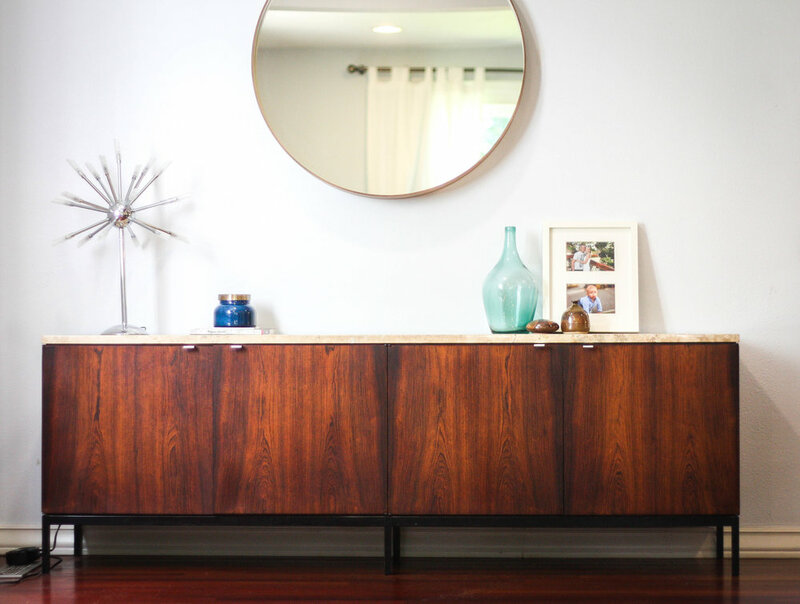 A stunning Mid-Century Modern rosewood Florence Knoll credenza with travertine top. This piece is in very good vintage condition and came out of a City of Seattle government building and was virtually unused. The grain is really incredible with book-matching across the door fronts. Black steel base is incredibly rare and has minimal signs of wear. The travertine top is clean. One small chip on the backside of the top which is not at all noticeable when pushed up against a wall. Knoll bowtie label on the bottom dates this piece to the 1950's. We dare you to try and find another Knoll rosewood sideboard with black legs and a travertine top for sale anywhere in the world. 74 3/4" long x 18" deep x 25" tall.